A watercolor canning jar becomes your sweet, country wedding invitation. The heavy weight, textured invitation comes pre-cut in the shape of canning jars for your convenience. Your wording is printed in your choice of colors and lettering styles. Invitation includes inner and outer envelopes. This product features thermography printing. Thermography is a unique printing technique that results in raised lettering you can feel, which adds to the luxurious experience of this printed piece. Jute cord is sold separately. Displayed invitation features 20" of jute cord. Please Note: Jute cord is sold separately. Displayed invitation features 20" of jute cord. I just received my invitations and they are absolutely amazing! They are beyond what I hoped! Everyone that has gotten one has raved about how nice they are! I highly recommend this product! This invitation is so cute & unique! The colors are beautiful & there is even texture on the lid. Absolutely love them, they will go great with our theme! AMAZING invitations. Envelopes were an ISSUE. We've had so many compliments on our invitations, since our guests have received them. Over the moon over the invitations. The outer envelopes were beyond frustrating. The normal adhesive did not stick. I had to, by hand, add my own adhesive to each and every 180 invitations. NOT A HAPPY BRIDE.With all said and done, I'm still in love with our invitations, but considering the money spent on these, I would have loved to not have spent as much extra time on the envelope situation as was necessary to get these out of the door and to our guests. I was very pleased with the product, the size was larger than I thought and the overall product was perfect. The customer service team where very helpful and delivery was fast. Perfect. Looks just as shown. Good paper quality/thicker than I thought it would be. Make sure you CHECK YOUR OWN SPELLING. Unfortunately no spell check, so triple check everything! Otherwise, great product. Was able to get a great deal with discounts/cupons. Used for wedding and reception invitations. I received them rather quickly. The color and size was exactly as pictured. I was surprised at the high quality of the paper. Can't wait to send them out. Great product!! Absolutely love the mason jar invite!! Super fast shipping and wonderful customer service!! Wedding invitations. Matched well. Expensive and did not come with string as shown. The invitations were beautiful!! The size was bigger/better than expected. The quality was very nice, the texture and colors match my wedding colors perfectly. I absolutely love them!! I just loved these. Mason Jars and burlap are our wedding theme and these were perfect! Super fast delivery, that way you don't have to worry about that. We used this as a rehearsal dinner invitation and it was so cute!! By far the cutest and best quality invitation I have ever seen and I am so proud to send them out to people! We were very pleased with the wedding invitations we ordered. They were beautiful, the quality was great and ordering was fast and easy too! Would definitely recommend this company to anyone. I LOVE THEM!!!! Turned out soooooooo good!! They look exactly like they do in the picture!! I couldn't image having any other card but this one for our wedding invitation! It is adorable online, but even prettier in person. The quality of paper and printing was great. I didn't mind not having color options and, in fact, appreciated that it was neutral and saved me the headache of trying to find the perfect color blend. The twine ribbon was not included and I ended up adding it to the order online. One roll was more than enough to add to 130 invitations. I wish I would have held off and bought something from a craft store closer to home so I could use it on other decorations for my wedding, but think any ribbon/twine really adds to the card regardless of where it comes from. I highly recommend this product for a casual rustic wedding! Delivery and service was exceptional. The invitations arrived several days before the estimated date. I appreciate that they enclosed notes about which envelopes went for the specific card and liked that they had grouped all the items together. They sent a proof before printing and that was great. They understood my instructions and were very helpful and polite on the phone. Would purchase from them again! There was nothing we did not love about our invitations! We order the canning jar wedding invitations. They are gorgeous. Very Rustic. Price was great and quality is excellent. Perfect Invite for my Rustic Wedding! My favorite invite for my Rustic Wedding. The quality is re at and so is the size! Can't wait to mail them out. 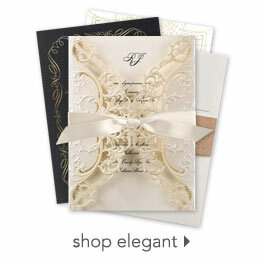 Invitations by Dawn has been a great company to work with. FAST shipping and Quality Products! I am absolutely in love with these invites that I just ordered and received!!! Cannot wait to send them out, they are PERFECT! I am so in love with my wedding invitations. They are so perfect! I have gotten so many compliments on them. No nonsense, you pretty much get what you order. No complaints, a bit thicker paper could have been a plus. Overall a great and affordable invite! My invitations are AWESOME! They are exactly what I wanted, and I've received multiple compliments on them. Everyone wants to know where I found them and can't wait for the wedding, after seeing how special the invitations are. Thanks again for making my wedding events even more special than anticipated. although i am happy with my save the dates, invitations and rsvp cards. i was a little unhappy to find that half my guest names were not printed on the items i bought. so now i have to spend few hrs to hand write 150 save the dates and invitations. UGHH. but i did recive them fast after i had placed my order. Love love love! Everything turned out perfect! Beautiful invitations and response cards, good quality paper, though they don't match the color scheme of the wedding, they match the country theme. These invitations turned out perfect. Couldn't have asked for better quality or customer service, the employees were very helpful and speedy in answering any questions. The invitations arrived much faster than expected, which was awesome! I ordered a set of 96 invitations and also one spool of twins, because I wrapped the twine around the card twice, as shown on the picture, I ran out by about 10 cards, I also had some length of some of the twine, just an FYI... Overall LOVED THE PRODUCTS! I love the wedding invitations and I got them in a few days! Love! We could not be more pleased with the Canning Jar Wedding Invitations. Great quality, excellent customer service and arrived amazingly quickly.Thank you! Awesome product - worth shipping costs? The product was beautiful and well made. We were very pleasantly surprised by the quality of the card. Was thrilled with the product but the cost of shipping it to Canada took some of the shine off our satisfaction. The cost to get it across the border ended up being a third of the cost of the order. This is in addition to the shipping charges charged by Invitations by Dawn. We were expecting to pay some duty but were totally caught off guard by exactly how much we were charged. It turned a product that was economical into one that was over budget. Really was too bad because we were thrilled with the product itself. I looked in my home town for these invitations. They were a lot more expensive. My invitations came fast and they were perfect. Great price(with the 20% off) GREAT quality and came packaged beautifully!!! Will always use them!!!! Fast delivery! So happy!!! Perfect for a vintage wedding. Very happy with invitations and speedy delivery! Awesome product for my wedding invitations. Delivery was not as prompt as I hoped for. However I was so pleased otherwise. These invitations totally exceeded my expectations. I have received many compliments on them. I ordered 2 spools of the jute cord for 84 invitations and only used one spool. The only thing I would caution people about ordering from this website in general is there are a few somewhat hidden costs. I wanted purple ink instead of brown which was $8 extra for each item (I ordered invitations, reply cards, and accomodation cards so it was $24 extra). Requesting an online proof was $5 extra for each item and once I received the proof and made some edits, they charged me ANOTHER $5 for each item to see the corrected proofs. In total, my proofs cost $30, which to me was a little much for just being able to see what I was ordering. RSVP card was nice and heavy; invitation, not so much Wanted heavier weight paper and all inserts to match in weight. All in all, however, pleased. I purchased mason jar invitations for my upcoming wedding. The mason jar invitations were of great quality and matched my wedding theme perfectly. I have ordered invitations for events previously on other sites and they quality of invitations from this site could not be matched. Not to mention this is the quickest I have ever recieved invitations I had printed from any site. This item is the perfect touch to my rustic wedding. I think it will give the guests an accurate idea of what to expect from our wedding. I can not wait to send them out! I ordered these invitations and they came a day sooner than I expected. Very prompt delivery! Everyone that received this canning jar invitation thought that they were so unique and absolutely perfect for my daughter's theme/wedding. Thank you! Thank you! Thank you! The the finished product was everything we wanted in an invite. We searched everywhere for something different that fit with our "vintage" theme. I couldn't believe how great the quality was and for a price that was actually affordable. As a college student who wants a grand wedding, it fit in budget but seriously the best invite I have ever seen! I have gotten so many compliments on these wedding invitations. They are darling beyond darling! Realy unhappy that the spelling was wrong. I checked this item over several times before sending it.. Kinda starting to feel like bridezilla but everyone is going to see these and now Ive wasted money.. They are great! We love them!! There was one comment I wanted to make that can go both ways; the string is not tied around the neck of the jar so we have to tie them all which some people might find inconvenient. I'm however ok with it because I feel like it will give me a chance to 'add' a little something to them myself and we also have over a year left so I am not on a time crunch and sort of looking forward to doing that part myself. Delivery faster than expected. On-line support helpful. Quality was wonderful! I can't wait to send these out to my friends and family. They are perfect for our Wedding!!! I was a little hesitant to purchase at first because there were no reviews on this product. I will be first to review and I absolutely love these invitations! Each one looks hand painted. The jute is an excellent touch. The sea-green color of these invitations is eye-popping. The picture really doesn't do any justice because these invitations are even more beautiful in person. The price was great. I believe I bought 150-200 invites and 6 rolls of jute. I ended up only using 2 rolls. You do have to tie the jute on yourself. With the invitation, the rsvp card, rsvp envelope, and reception card...postage was 66 cents. I've already received so many compliments on these invitations. I am extremely pleased with this product. I paid extra for expedited shipping which was excellent. The invitations came within a week! The product arrived in excellent condition. Customer service was also very prompt,attentive, and responded to my e-mail immediately when I had a question.